As I’ve discussed a few times on my blog, the trend for re-purposed, recycled and up-cycled finds has been a hot topic of conversation. Now we are seeing this trend take a step further into the world of hand painted homewares. Whilst trawling the latest trends on blogs and social media, I found myself stumbling across some amazing ‘Crafties’ out there who are painting anything from planter pots to lampshades with the goal of transforming a plain or simple object into a colourful and vibrant homeware. I thought it would be a good idea to share with you my top picks for this latest craze, which has, incidentally, moved from a small time craft hobby into mainstream shopping. If you are wondering what I am going on about then read on and be ready for some bold homeware action! Let’s start with ShadeOnShape. I discovered Sonia Jak’s work on Esty and was blown away by her beautiful designs. Her use of colour is sophisticated and modern. 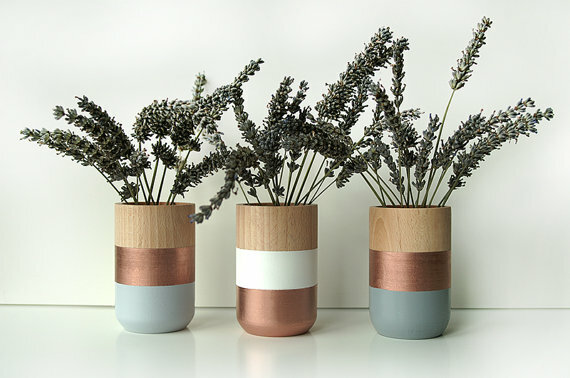 She incorporates the right balance of tone by pairing pastel hues with edgy metallics such as copper and gold to give her wooden vases some serious wow factor. These have to be my favourite examples of painted homewares and would suit the more simplistic style of home. Concrete, normally know for its cool, masculine feel, is given a girly makeover with splashes of bright acidic colours painted in uneven stripes around the bases of these sculpted pots made by Sarai Homewares. 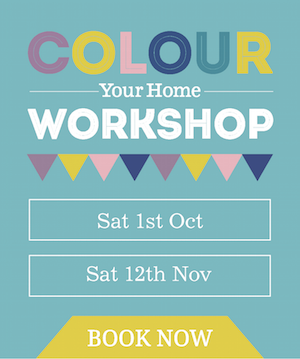 She transforms an industrial material into a fun homeware that will brighten any space. 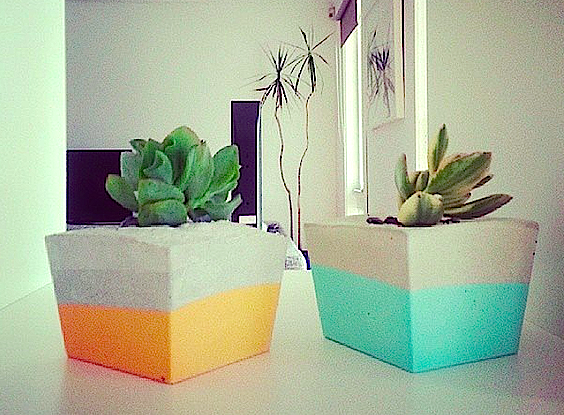 A favourite amongst the in[ternet] crowd are these fabulous painted terracotta planters by Pop & Scott. The multi-talented duo are known for their crafty transformations and have created this amazing range of homewares with the aim of adding some fun to the home. 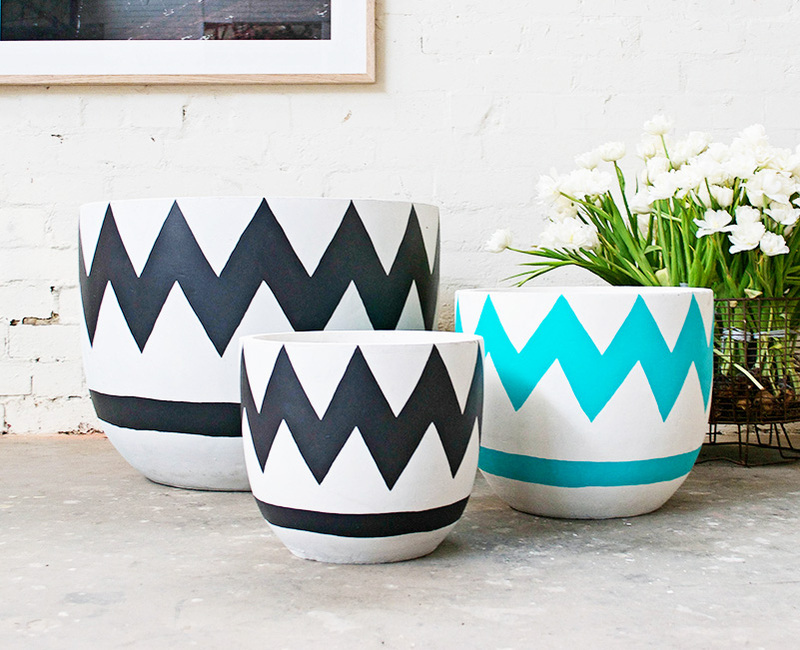 They paint bold patterns and colours onto white primed pots. The result is dynamic! If you have your eye on one get in quick because they won’t last long. Moving away from pots and planters and into the world of lights, I couldn’t resist sharing another fave of mine from Lightly. 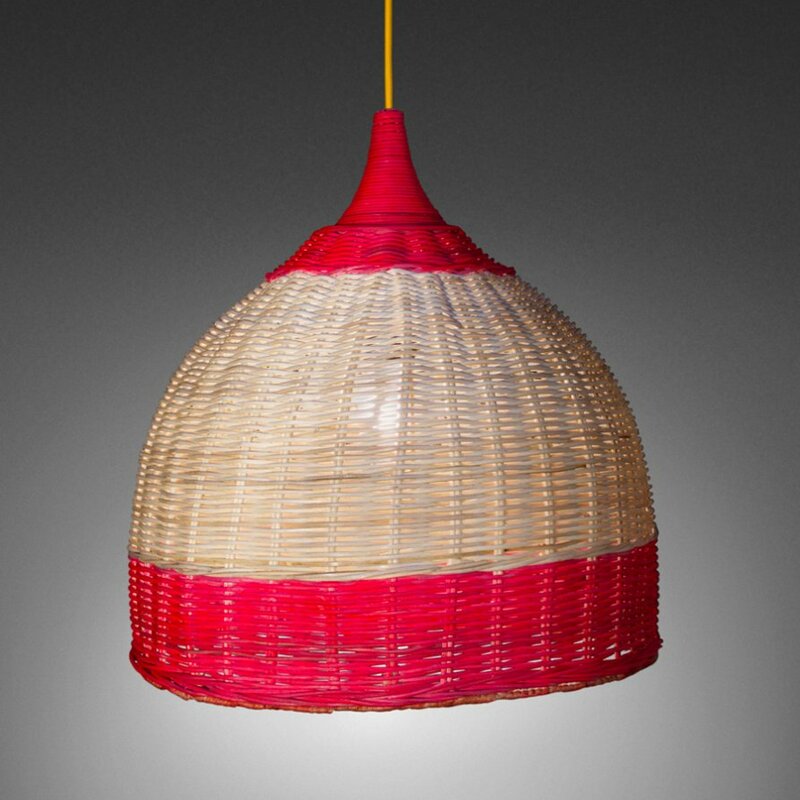 They take a simple hand woven rattan lampshade and highlight it with colour, taking it to a modern level of style that works really well. They come in different sizes and colours, so be brave and light up your home with a few of these. The example above is called ‘Margarita’, which sums up the liveliness and fun these products illustrate. What would you paint to in order to make an impact? You might want to dip your dining chair legs in a metallic glaze, or jazz up your wooden spoons in bright colours. Whatever it is, I want to hear about it! Get in touch on Facebook or Instagram and share your painted projects or feel free to comment below if you just want to vent your thoughts. Bold homeware action indeed! Love it. I am really liking the stripes and chevron prints. You have found some really pieces of furniture. Thank you for sharing.